The stamp market has its own eco system with key dealers, main collectors, international fairs and press. Each colleague presents a sector of the market as well as the highlights of his national stamp market. This essay is looking at the stamp market from the economic perspective, describing the factors that influence monetary value of a stamp, establishing authenticity, looking at the performance of the market, and finally describing the highlights of the Russian market. All the market segments are related and some of the research among group members overlaps. The value of the stamp is the cornerstone of the stamp market: if there is no monetary value there is no market. Hence, it is crucial to determine what influences the value and what is so special about stamps. Research indicates that the high-end stamp market is rather small and the majority of the pieces are medium to low-end. The study suggests that age, rarity and condition of the stamp are the key factors that determine the value of the stamp. Generally the older the stamp the more desirable it will be on the market (Fairchild, 2012). However, even though the stamp is old it does not necessarily mean that it will be expensive – the rarity is as important as the age. Rarity is defined by how many stamps were issued and how many of them have survived. For example, there were 150 million one-cent Benjamin Franklin stamps issued in 1861, hence, these stamps are unlikely to achieve high prices. Condition is essential for the value. The condition of gum influences its value. The stamp, which was never used and is free from any disturbance is called mint and is the most valuable. The gradation for the condition of the stamp varies from dealer to dealer. Siegel Auction has six categories of gum condition: mint, lightly hinged, hinge mark, part of original gum, small part of original gum and no gum (Siegel Auction Gallery catalogue). Mint, lightly hinged and hinge mark stamps of pre-1980 are sold at a premium. However, there are some exceptions: stamps issued in tropical climates are expected to have some gum disturbance due to humidity, and such condition is not considered a negative factor in pricing. Sound condition of a stamp is also determined by the face of the stamp – the design should be centred and the colours bright. Perforation should be round, even and clearly cut. Used stamps are generally more valuable still attached to the envelope or post card, rather then removed from it (DuBasso, 2012). This is because if removed the gum will be damaged. Unlike any other art market – mistakes, misprints and errors add to the value. A faulted design of the stamp is considered to be a pure rarity and hence increases the value. The reason for that is the strict quality control: the faulted stamps were usually destroyed before distribution. Therefore the stamps that survived are rare and expensive. For example, Tre skilling Yellow stamp issued in Sweden in 1855 is the most expensive result of a fault in printing. Originally, all these stamps were produced in green, however, one sheet of nine stamps turned out to be yellow. Only one stamp is known to exist, which definitely contributes to its value. Moreover, after long discussions about authenticity of the stamp, two independent experts have declared it to be genuine. Furthermore, its provenance also adds to its value – it was in possession of King Carlos II of Romania. The stamp was sold privately and realised price is unknown, but according to the Scott World Stamp Catalogue (2013) a used Treskilling Yellow stamp is worth 3 million USD. The good condition of a stamp does not guarantee a good price for it because there has to be a demand for the design and the country that issued the stamp. There are different trends in the stamp markets and some stamps are more desirable than others: for example, stamps from the UK, French and British colonies and from Russia are generally more expensive than Israeli and Scandinavian stamps. When determining the value of the stamps it is always useful to consult stamp catalogues. The first catalogues were published in the early 1860s in Great Britain and United States. Originally they only printed the dealers’ prices for stamps. However, philately developed as a hobby over time and now there are plenty of printed and online catalogues over the world. Today’s catalogues provide not only price, but also further details such as issue date, colour variations and different values according to condition. There are four main catalogues that cover stamps internationally: Scott, Yvert et Tellier, Michel, and Stanley Gibbons. These catalogues have different editions and sections divided by countries and updated every year. There are a lot of domestic catalogues that are issued by leading philatelic dealers or institutions. National Post Offices publish catalogues with the new stamps. However, stamps issued for the last 60 years are generally worth only face value because of the large circulation, unless the stamp is a very limited edition (Mackay, 2012). Editing the catalogue can be challenging because the value for each stamp should be reviewed individually. According to Charles Snee, editor of Scott catalogue (2014), four editors are working on updating the information and consult dealers and collectors on the subject of value. They consider the stamp market for each country and collectively decide if the value increases, decreases or remains unchanged. The catalogues make it easier to identify the fake: each valuable design can be found in the catalogue. Genuineness determines the value of a stamp. Authenticity is a big issue in the stamp market as in any other art market. There are connoisseurs, usually collectors or dealers with a lifetime of experience, as well as chemical tests, which analyse paper, ink, and gum. There are new chemical tests that are available on the market – infrared spectroscopy – which examine all components of a stamp without damaging it (E. Imperio et al). 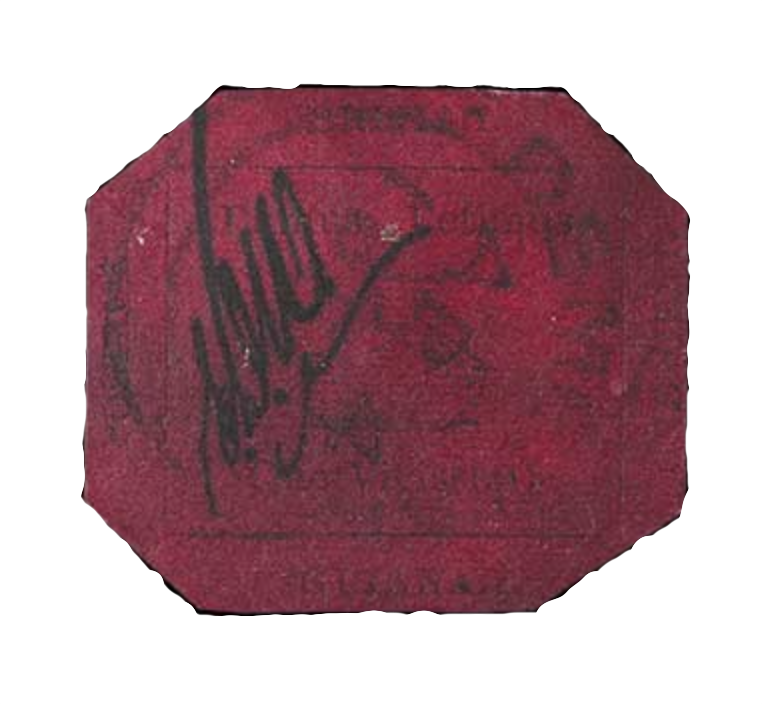 Usually, the auction house stamps are sold with certificates of authenticity. For example, the most expensive stamp ever sold is the one-cent Magenta, The British Guiana stamp issued in 1856. It was sold by Sotheby’s New York for 9,480,000 USD including buyers premium in June 2014. Interestingly, even though it is the world record price for a stamp, the estimated value was 10 to 20 million USD and the realised price did not reach the low estimate. This stamp is the only one in existence; it was issued as an emergency stamp when the British colony ran out of stamps. It had impeccable provenance which was a significant factor in determining authenticity. All owners can be traced back to twelve-year-old boy who discovered the stamp in 1873. The stamp was sold with two “Genuine” certificates (Sotheby’s catalogue) issued by the Expert Committee of the Royal Philatelic Society in 1935 and 2014. To further ensure authenticity, experts from the Smithsonian National Postal Museum also examined the stamp before the sale. Generally, the more rare and expensive the stamp is the more important is its authenticity. Such high prices for a stamp as for the one-cent Magenta are extremely rare. Market performance over the last decades was analysed by looking at the annual Rarities of the World sale by Siegel Auction. This auction house was chosen as one of the biggest auction house specializing in stamps and the data for each sale is available online. The auction house holds many medium value auctions, but Rarities of the World sale is the most important event of the year. The value for the first sale in 1964 is also included to give an idea of where it all began. The data was collected manually and all lots were added individually. Total Sales graph shows the overall dynamic of the stamp market. The sales fluctuate and there is no clear trend. The revenues were declining before the 2008 Economic Crisis, but the market is gradually recovering since 2011. Rarities of the World sales sometimes include manuscripts, envelopes, and postcards. In 2012 the total sale reached almost 6 million USD, however, this was due to the sale of Emancipation Proclamation signed by Abraham Lincoln for 1,850,000 USD. This sale can be considered as an outlier because it was not a stamp and the price was much greater than for the other lots. To make the results more reliable there is also shown an outcome without this outlier. The Average graph shows that the average realised price per sale is rising over time even when the outlier is not taken into account. The average was calculated by dividing the total sales by the number of lots per sale and included the bought in lots. In order to determine why the average is increasing the total number of lots statistics has been created. It can be seen in the graph below that the number of lots per sale is decreasing over time. It can be concluded that there are fewer rare stamps in the market, but they are getting more and more expensive as the average price is rising. The research about market performance could be improved by collecting data from other sales; however, the data is not available. Moreover, the private market is unknown so the market analysis is not representative. The second part of the study is devoted to the Russian Stamp Market. Unexpectedly the Russian market for stamps is rather developed and Russian stamps are recognised internationally. Even though the market experienced a slowdown after the fall of The Soviet Union, philately is slowly recovering its popularity. Collectors are generally aging population and collections are mainly medium to low in value. It is considered a hobby of childhood, rather than serious investment. Among people who are collectors, 18% collect stamps according to Sterlegrad (2011), which makes stamps the third most popular collectable in Russia after coins and small statues. During the USSR period philately was extremely popular and everyone collected stamps. However, the reputation of the country was damaged because the government was issuing so called cancel-to-order stamps (Moneu, 2014). The post administration was printing more stamps than needed for the postal services and was selling the excess in bulk to collectors cheaply. This almost destroyed the market of used stamps in Soviet Russia. According to the newspaper “Izvestia” (2013), Russians were spending 40 million USD for different collectables online in 2007, compared to 2 million in 2007. This is not only because collecting is more popular, but also because of increasing number of Internet users and the development of Internet platforms. The majority of stamp dealers are online platforms such as Molotok and Marka – they sell both low and high value stamps. There are some dealers in large cities, but they usually specialise in different types of collectables. There are two auction houses that are devoted to stamps or have stamp departments: Gelos and Pugachevs Auction House. However, they are not popular as collectors still prefer buying stamps online or in dealers’ shops. Bookshops also sell stamps in the “Antiques and Collectables” section and provide certificates with each stamp and are highly trusted by collectors. The stamp market is transparent because of the existence of the catalogues; however, all private sales are still unknown to the general public. The data found on the Internet was arranged poorly and sometimes out of date, especially for the Russian market. This essay provided an opportunity for students to analyse the information that has been found and include material that was not in the presentation. In conclusion, it should be said that researching and analysing the stamp market turned out to be challenging and informative.